The Golden Retriever is one of the more popular dogs in the United States. It makes an excellent pet as well as a work dog. It's a medium size dog known for its golden coat. Where do Golden Retrievers come from? They were originally bred in Scotland in the late 1800s by Lord Tweedmouth to retrieve birds, especially waterfowl that were shot down while hunting. As a result, they are excellent retrievers and love the water. They also have a soft mouth which enables them to carry game without damaging it. 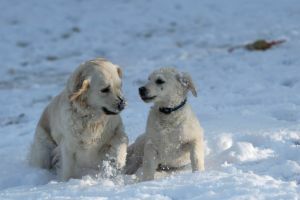 The original Golden Retriever was a mix of a number of breeds including the Tweed Water Spaniel, the Yellow Retriever, the Bloodhound, and the Irish Setter. Golden Retrievers grow to around 22 inches tall at the shoulders and weigh between 50 and 75 pounds when full grown. Females are generally slightly smaller than males. Their golden coats are dense and waterproof. Their fur can be straight or slightly wavy. They have a lifespan of around 11 years. 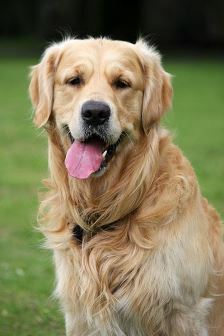 Like many dogs, Golden Retrievers were first bred to work. Initially they were hunting dogs, but due to their intelligence, obedience, and desire to perform they have been used in other areas as well. They love to work, but also have the patience to sit still and wait when needed. Today they are used as guide dogs for the blind, search and rescue dogs, narcotics detection dogs, hearing dogs for the deaf, and they are still popular hunting dogs. Because of the Golden Retriever's good demeanor, they are very popular as pets. Typically they are intelligent, calm, loving, athletic, and eager to please. They tend to be gentle towards kids and other animals as well and are often easy to train. Because they are so nice and unaggressive, however, they are not the best guard dogs as they are generally nice to all people, even strangers. The first three American Kennel Club Obedience Champions were Golden Retrievers. They starred in the dog movies Air Bud. President Gerald Ford had a pet Golden Retriever named Liberty. There are British, Canadian, and American versions of the breed. They have been known to take care of other animals, even kittens! They are considered the fourth smartest dog breed. Some Golden Retrievers have learned hundreds of words as commands.